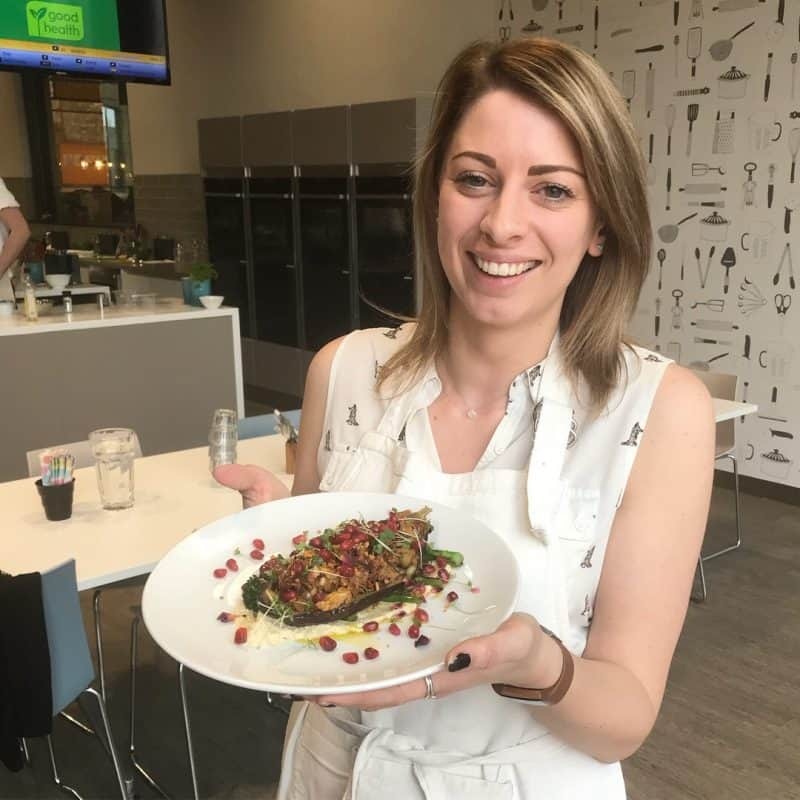 I was very kindly invited to the Waitrose Cookery School in London ahead of a recipe creation project I worked on with them. While I was there I met some great people and learnt some new skills. 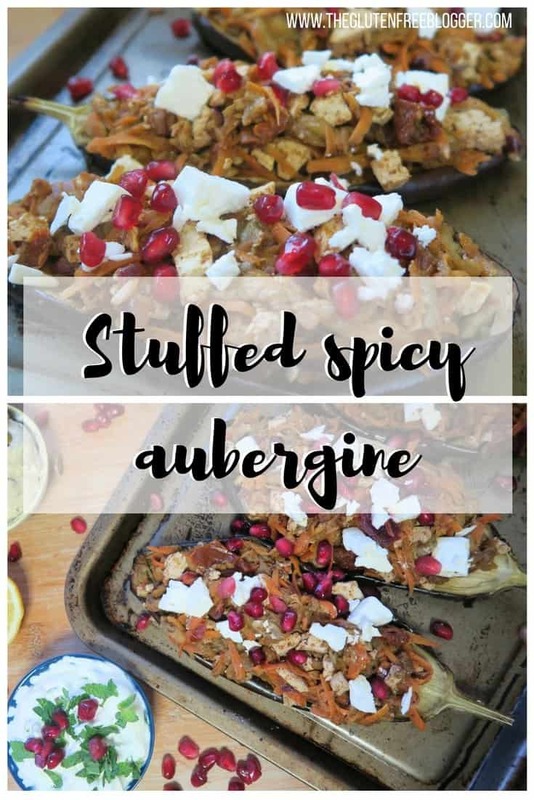 We made these delicious baked aubergines with smoked tofu and wild rice, and I couldn’t wait to recreate them at home. I wanted to adapt the recipe slightly and put my own twist on it. I added feta to mine (though if you want them to be vegan or dairy free, you could easily remove this) and made a Greek yoghurt dip too. I also removed the rice to make these a lower-carb recipe and added in grated carrot instead. I thought this worked really well with the spice combination. I also learnt some about some amazing new ingredients at the cookery school which I am a little bit obsessed with! Baharat is a Middle Eastern spice mix which has this delicious, spicy, smoky flavour. And Sumac has a really lovely, zesty taste. This recipe is vegetarian but so filling. The smoked tofu makes sure you get a good protein hit – I am actually now in LOVE with this Taifun smoked tofu. I’ve never been a huge fan of tofu as I find it bland but this tastes insanely good and I love the crunch of the seeds and almonds in it too. Definitely worth a try! 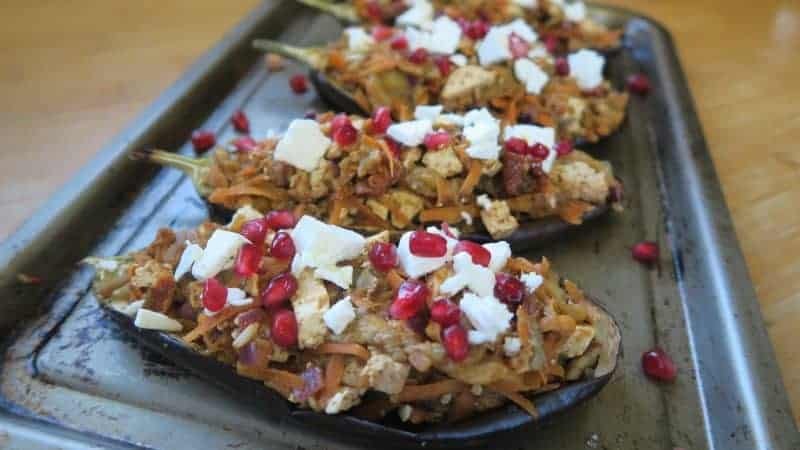 These stuffed spicy aubergines are gluten free (and can be made vegan by removing the feta) with middle-Eastern spices and a minty yoghurt dip. Preheat the oven to 180’C. Cut the aubergines in half, score and smother with the smoked garlic paste. Drizzle with a little olive oil and place in the oven, bake for 40 minutes. Peel and finely chop the red onion and the garlic clove. Grate the carrot. Add 1 tbsp olive oil to a large pan on a low heat. Add the onion and fry for 2-3 minute until it starts to soften. Add the garlic and chopped chilli and fry for a further minute. Then add the carrot, sumac and baharat, stir well and fry for a further five minutes, still on a med-low heat. Chop the tofu and the sun-dried tomatoes into small chunks and add to the pan. Stir well and fry for a further minute or two. Add the lemon juice and stir. Remove the aubergines from the oven, scoop out the flesh and chop roughly. Add to the pan, mix well, heat through and then spoon the mixture back into the aubergines. 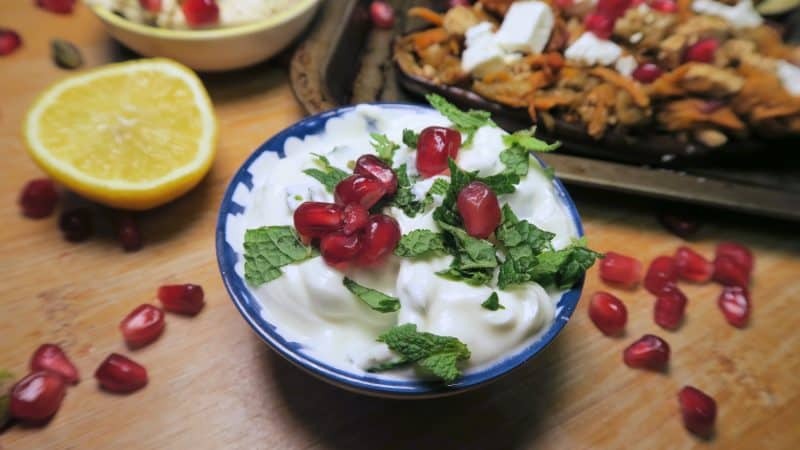 Make the dip by finely chopping the mint leaves and mixing into the yoghurt. Sprinkle the feta and pomegranate seeds over the auberines and serve with the dip alongside. 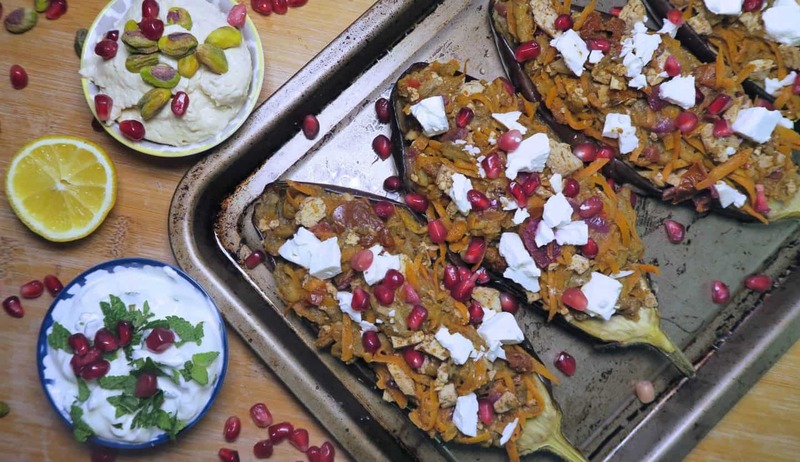 These are also delicious with some pistachio nuts sprinkled on top and an extra side of houmous! There you have it, the perfect recipe for a Meat Free Monday, or any other day of the week you fancy something tasty, filling, and a little bit different! Let me know if you give these a try because I love seeing your creations. You can share them on my new Facebook group or tag me on Instagram! Previous Post Gluten free Mini Egg cookies – so good you’ll struggle to share them! Next Post Miss Ben and Jerry’s? Make your own super easy gluten free cookie dough ice-cream!